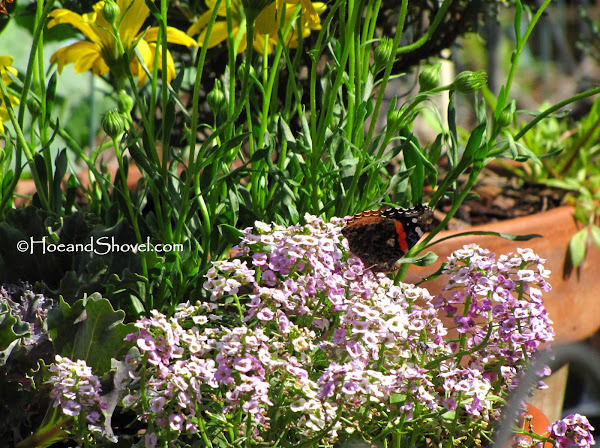 Sunshine on a cool winter day urges gardeners and critters alike to bask in the wondrous beauty of nature. A stellar gardening day sandwiched between some cloudy, rainy days yesterday drew me outdoors for more winter clean up. 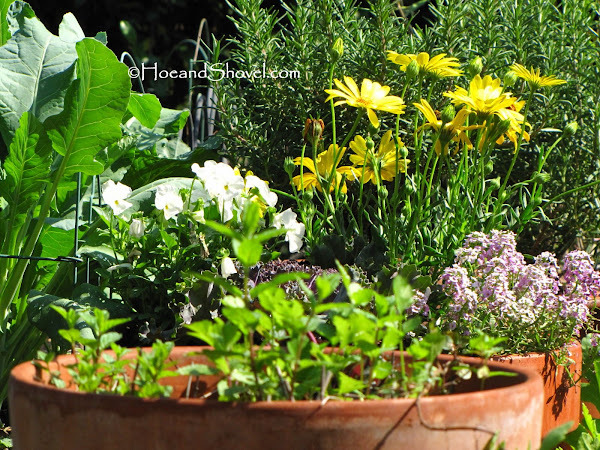 The edible garden is the place where the sun brightly illuminates unhindered for about 6 hours. Less hours during winter but when it shines the entire place is a symphony of humming and buzzing. 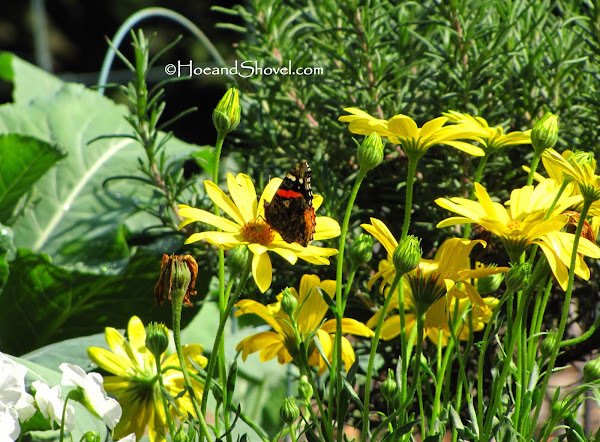 Two red admiral butterflies adding to the brightly colored blooms flitting from place to place bring a smile to my face. Landing here and there and sipping from their choice of nectar. More sunshine means more flowering plants and since my garden is mostly shady elsewhere I take the liberty to add as many flowers between the edibles as I feel I have room to spare. Mixing them in with the edibles is especially satisfying. To my senses and to the pollinators. 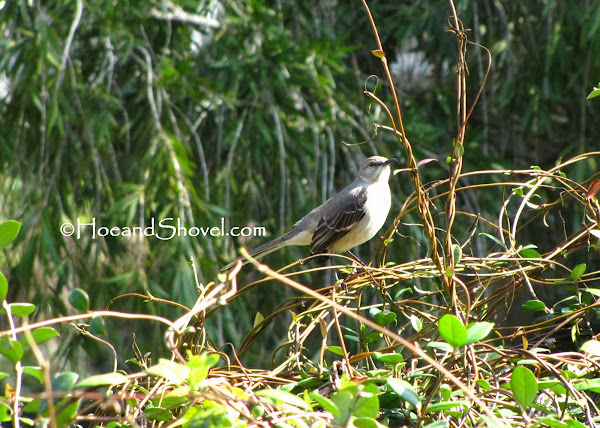 Close by, watching me from the perimeter, is a clever and animated mockingbird. Sitting happily atop the sprawling Trachelospermum jasminoides confederate jasmine which covers the ugly chain link fence for the longest minutes. [I'm grateful for the fence these days though as it keeps the edible garden contained and safe from walking critters that might otherwise seek to harm.] I just kept inching my way closer. In between my sly movements leaning down to pull a weed or pluck a dead flower. Probably wasn't fooling my mockingbird in the least. He was just soaking up all that beautiful sunshine and cool air just like me. Don't you love having wildlife make their home in your garden or just deem it worthy to pay a visit while passing through! Are you starting to see the sun or signs of wildlife where you are? There's always something to see in the garden. The life the critters add to the garden is just as important to me as plants and flowers. What critters are making you smile today? 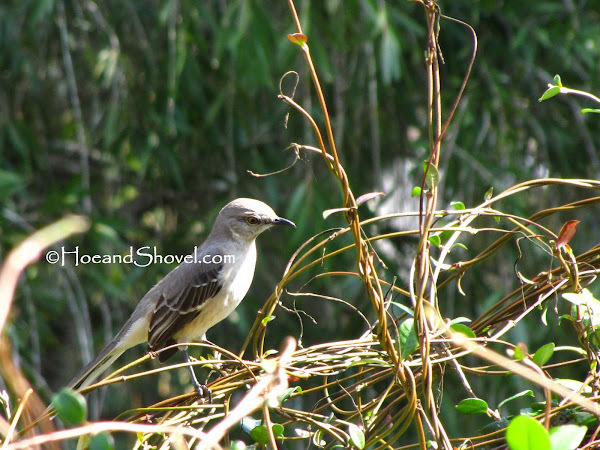 *** The northern mockingbird is Florida's state bird. It is also the state bird to Arkansas, Tennessee, Texas, and Mississippi. Oh I am sure he saw you as the provider of his wonderful perch! I do love it when the birds in my garden dont fly away when I approach. I noticed so many birds and butterflies around when the cylone was approaching. Probably looking for a safe spot to hide! Yesterday was a gorgeous, sunshiny day, but--wow--it drizzled all day today! We had a window of maybe 30 minutes without rain. Your sunny photos are certainly a cheery thing to see right now. 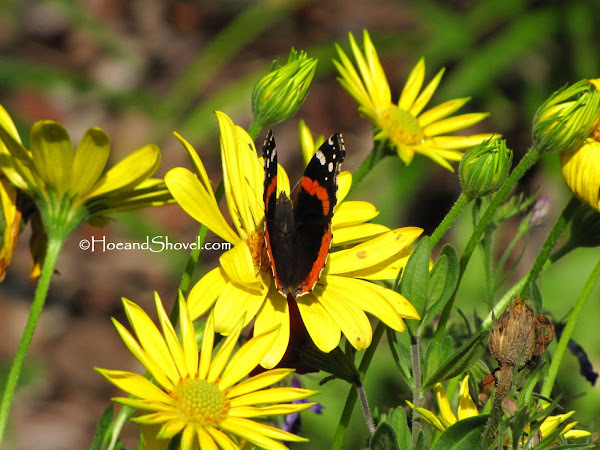 We've had the red admirals all over the garden the past couple weeks. It seems I only see them this time of year for some reason. Hey! I haven't forgotten you! I stay fairly up to date in the reader, but am trying to find more time to actually visit a few blogs. How I long for some sunshine! I've caught one or two fleeting glimpses of the sun this week. Mostly, though, it's just solid cold and gloom. We are starting to see a moth or two, but no butterflies yet. 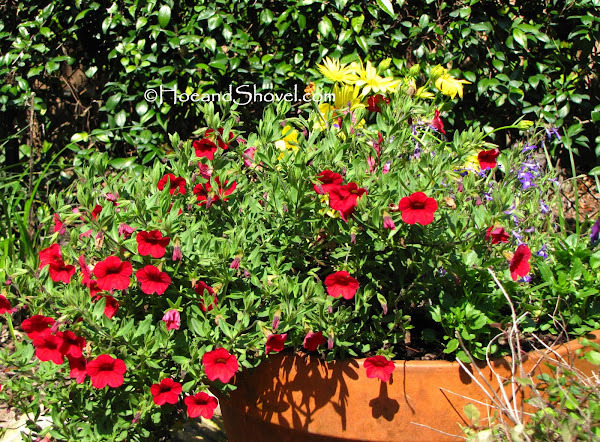 Thanks ever so for sharing your BEAUTIFUL and colourful garden with your still-surrounded-by-brown friends! We had a bit of sunshine today. 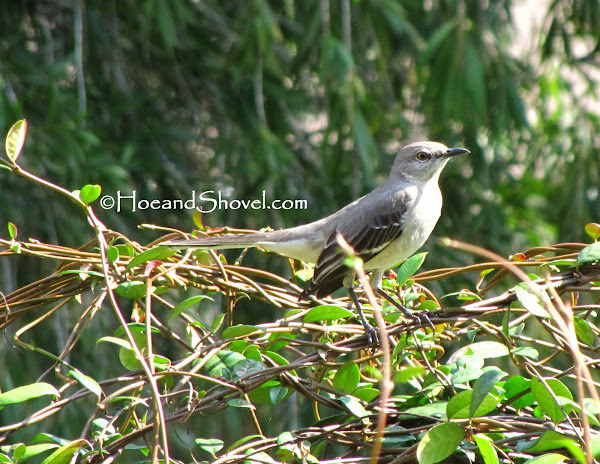 We also had a mockingbird in our garden but there the similarities end. The high today was a warm 20F. Our mocker has been holding court over our holly berries lately. He will soon have them all eaten. So nice to see sunshine and flowers. What fun you've had with your mockingbird. Your patience was rewarded with some great shots. I never seen a mocking bird before. Your little guy is my first! He surely seemed comfy up there higher than me and looking down at me. It's amazing how connected to the weather patterns the birds and butterflies seem to be. I guess it is part of their instinct and protection. Today it only rained for a short while but the rest of the day it was dreary and windy. But YESTERDAY! Perfect. I agree the red admirals always appear this time of year and seem to fade as spring sets in. So good to see you. I have not forgotten about you either although one would think. :-) Actually I think of you often. I made it over to Caladesi a few weeks ago and thought of you. I know your weather has been awful up there. You guys always catch the south end of some of those cold fronts that don't make it down to here. Wouldn't it be a dream come true for you if ya'll were to move back here! Keep me posted on that. (Not a fan of that word for word verification :-) God bless! Oh, sunshine is heavenly isn't it! Even when it is 20*F outside. It's good you have berries left for the birds. They will wipe them clean for certain. Perfect timing then for you to get to see your first mockingbird. They have the sweetest songs to sing,too. Just planted a few flowers along with some flower and herb seeds in the veggie bed. I will have to be on the lookout for a Red Admiral. I've never noticed one around here. I agree that all the flitting, buzzing and singing creatures are an important part of the garden. 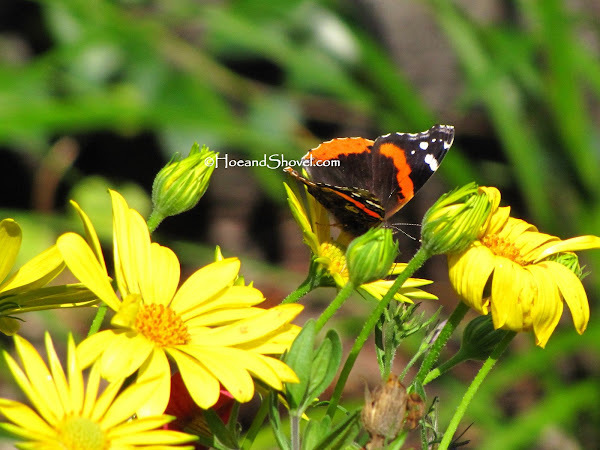 Greatly enjoyed the photos of the wildlife in your garden. Lovely to see so much color! Hi Meems...It would be lonesome in the garden without bees humming, birds singing and butterflies and others drifting by. ou have butterflies already? Wow! I've only had Suphurs,so far.But I have hope. Loving this weather-makes gardening much easier,doesn't it? Re the word ver... me, either. I hesitated to even spell it out, but it does kinda fit our weather of late. Can hardly wait for spring! So much fun for the eyes and the critters to see those flowers when mixed with edibles. I know you are enjoying being out there with this fabulous weather. They will find you. 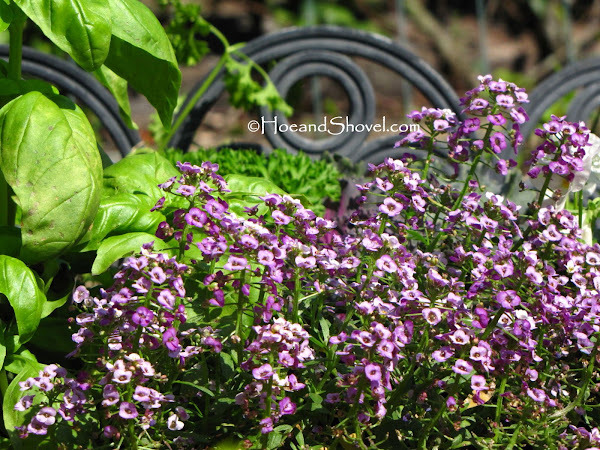 You are doing everything right to bring them to your garden. Sunshine is good especially on the coldest days. The mockingbird is known for his antics more than his looks. I love/need my alone time in the garden. All that nature offers becomes my friend as I work. The amazing existence of life all around me. Yes, LOVE LOVE this weather. (Digging up sod in it).I've seen some Gulf Frits, skippers, sulphurs, and even the tiny yellow ones and tiny white ones (don't know all their names). They are brave survivors I suppose. That weather we had last week was not typical Florida. A cloudy, dreary front hanging over and wouldn't leave. But you all were MUCH colder than down here. Sunshine should be warming your earth today! Thank you. 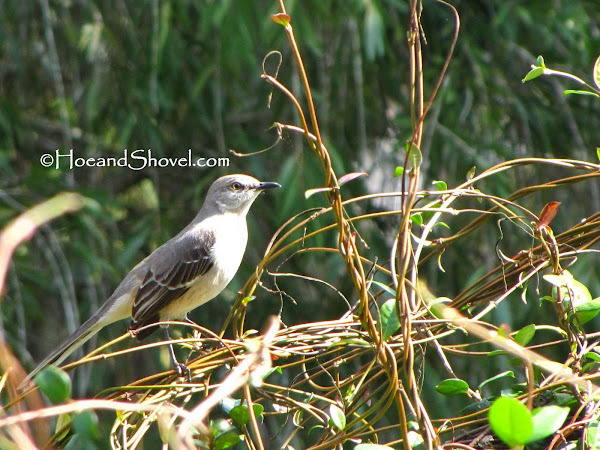 That mockingbird hung out comfortably for many minutes. It was a large hawk that eventually scared him to take tree cover. Oh girl, your pics are like balm to dry and thirsty eyes longing to see spring again! Longing for flowers and birds singing, and spring rainstorms, and green grass...soon maybe. Thanks for helping me get through the colorless days. 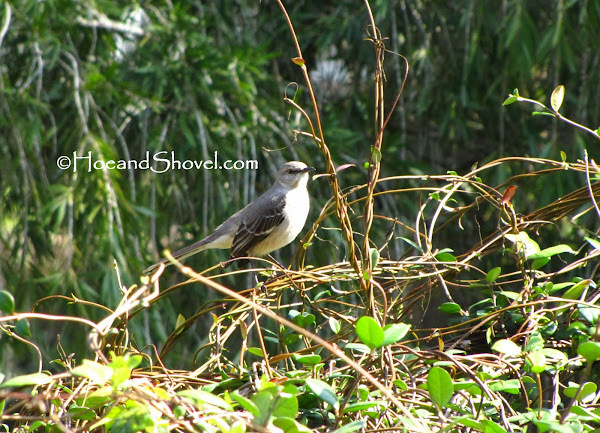 Well since I don't have mockingbirds in my neck of the woods, it was a treat to see them in yours. Oh, it shouldn't be long now... it's been a tough winter for parts of TX but spring is so close by. They definitely sound prettier than they look, Grace. But all the birds make me smile.